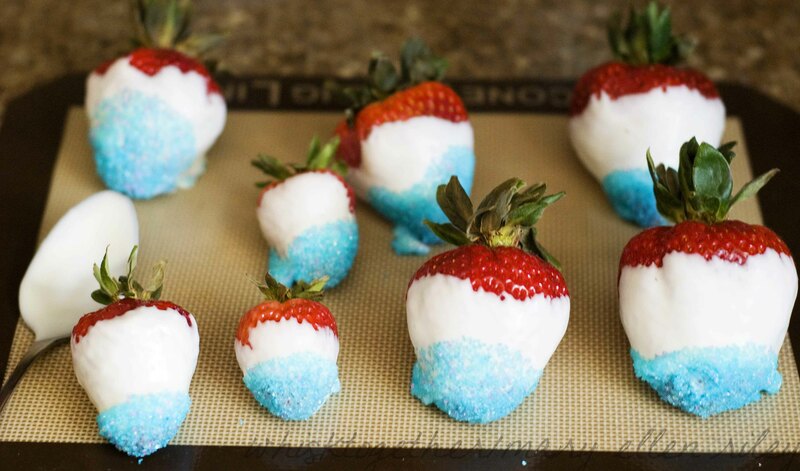 Since most people have seen the dipped strawberries before, I have included it here with a new recipe of mine. I took my Blueberry Cheesecake Ice Cream and put it between graham crackers because I wanted cheesecake with a graham cracker crust, but I didn’t want to bake anything. They were super easy and handed out easily at the party. I love things that can be made ahead of time! 1. Take 3-4 Tb. of ice cream and dollop on top of 1 crackers. Spread and smooth. 2. Top with the other graham cracker and store in the freezer. 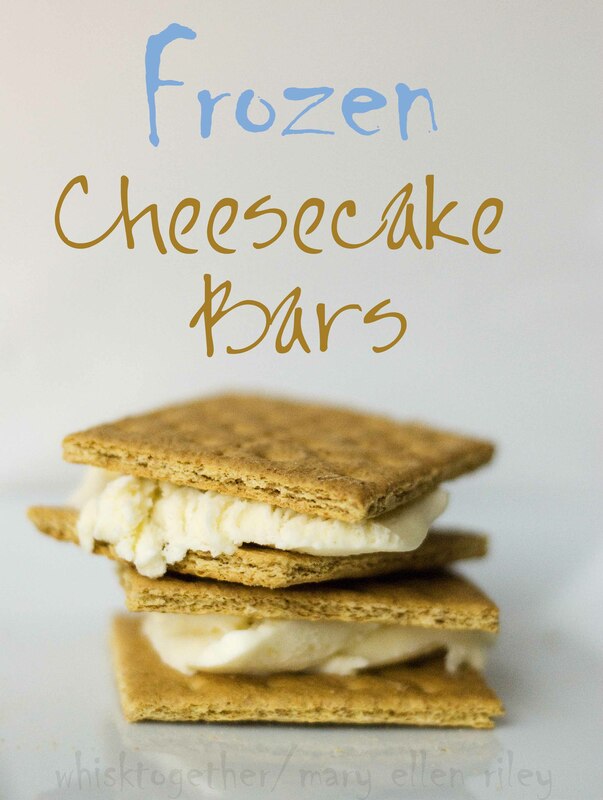 Try to put them in the freezer as you make them or they tend to start melting a lot. 1. 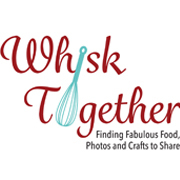 Mix in a medium bowl with a whisk. Chill in fridge 1 hour. 2. Pour into ice cream machine and run for 25 minutes. 3. Use on crackers or freeze harder in the freezer. Feel free to make Blueberry Cheesecake Ice cream too! 1. Wash and dry strawberries completely. If the strawberries are a little wet, the chocolate won’t work well. 2. Melt almond bark in microwave. 3. Dip strawberry 3/4 of the way into the chocolate and then let the excess fall off. 4. 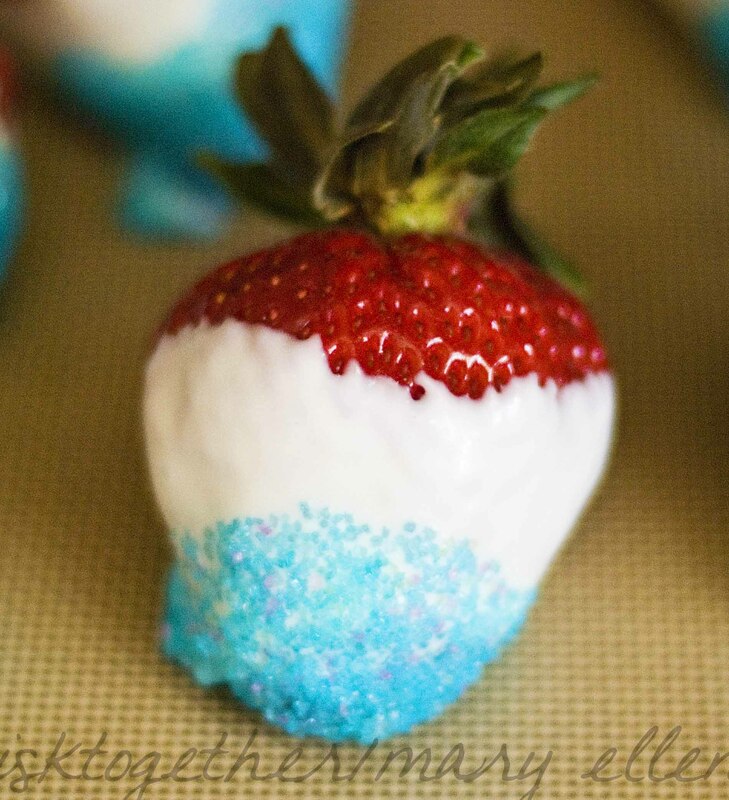 Dip strawberry in blue sugar sprinkles. 5. Let dry on wax paper or silicone mat. Store at room temperature that day. If you need them for tomorrow, store uncovered in the fridge overnight and sit out 30 minutes before serving.